A trail is made by walking and wearing down a path, right? Well, yes, but the trails you and I enjoy in the Santa Fe area are more likely to be the result of careful planning and/or a lot of hard work. Some of our older trails are work trails. Borrego Trail #150 began as a stock driveway. It served as a fairly direct route from town up into high meadows where sheep could be grazed. 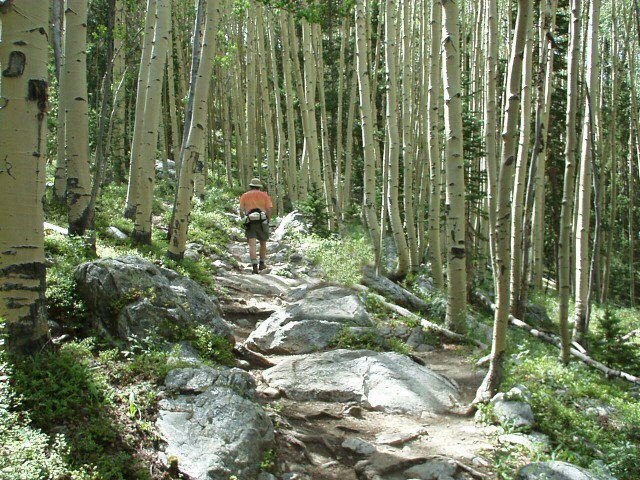 Winsor Trail #254 has a similar origin as a direct route through the high country from stock areas in Pecos Wilderness down into Tesuque Village. More extreme examples of this type of trail may be contemplated in the historic Santa Fe Trail (Missouri to Santa Fe), the Camino Real (1600 miles from Mexico City to Santa Fe), or the Old Spanish Trail (Santa Fe to Los Angeles). This type of direct trail is often braided–an aerial view would show a series of parallel tracks converging at bottlenecks like stream crossings or mountain passes. As particular spots get worn, eroded, boggy or rutted then travelers coming along next will bypass the ugly spots and walk or ride around resulting in the braids. It certainly serves the purpose, but makes a bigger impact on the landscape. During the 1930’s and up until WWII, groups of young men were employed as the Civilian Conservation Corps and paid to work on public projects. In Santa Fe, we have some fine public buildings like the “old” post office (now the Museum of Contemporary Native Arts). The historic park buildings in Bandelier National Monument and Hyde Memorial State Park are a result of their work. And there are lots of trails, good trails. On at least one trail off Hyde Park Road, it’s still possible to make out the crew marker carved in a wooden post and dated 1939. These crews built trails wide enough for a rider on horseback to use, chose or modified routes that were more likely not to erode, and added reinforcing structures like retaining rock or logs to shore up edges. Much of what modern trail engineers do is similar: lay out paths that will hold up well over time and use. Newer recreational trails may be laid out with a different idea than these older trails. 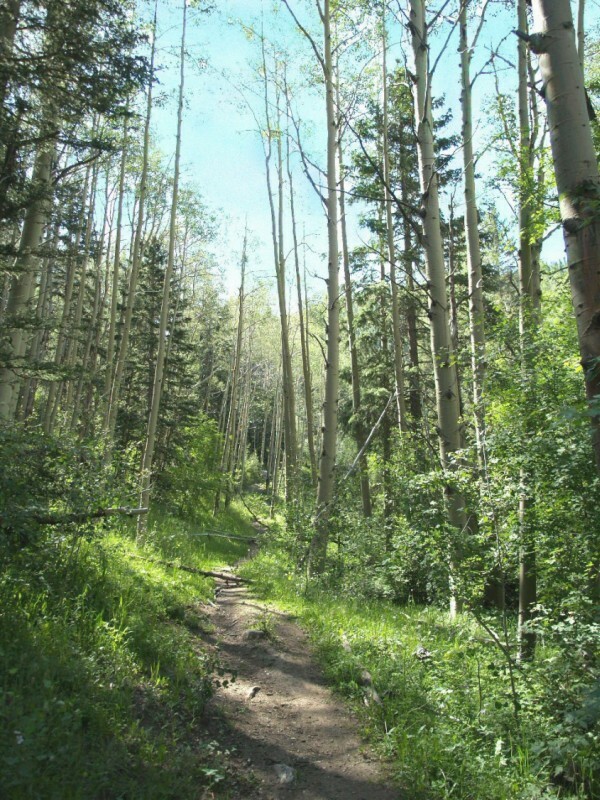 The Norski Trail near Ski Santa Fe is a good example. It was proposed and built by volunteers who wanted a dedicated trail for cross-country skiers. Circling a ridgeline, the group laid out a series of loops to maximize the linear distance without exceeding the acreage of the fairly rolling terrain, thereby avoiding the steeper pitches that are challenging to touring skis. The beloved Dale Ball Trails in the Santa Fe foothills are done the same way, traversing the available land parcels with loops to let us enjoy a fine walk rather than the shortest path between points. So as you go on your next hike, think briefly on the nature of your trail. This entry was posted in Human interaction, Nature&history and tagged hiking, history, mountains, New Mexico, outdoors, Santa Fe, trails. Bookmark the permalink.